When one thinks of healthy ingredients, tofu tops the list. Here, Chef Boy demonstrates how to cast a spell to make Magic Steamed Tofu with Shrimp Mousse. Of course, there are many kinds of tofu. 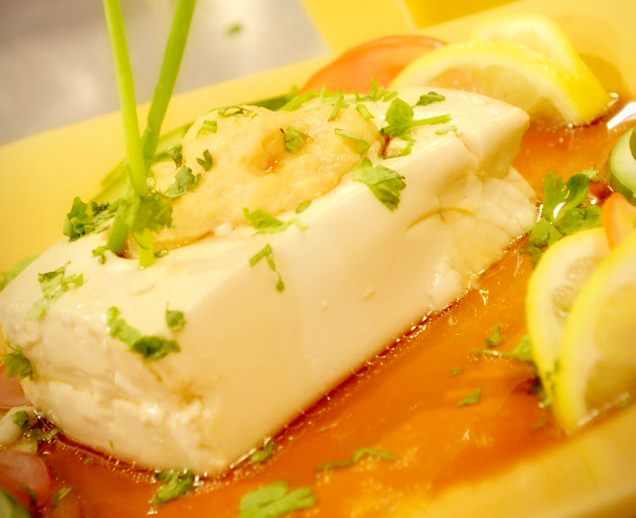 For this special dish, the culinary whiz uses soft tofu or silken tofu which is much higher in water content which explains the soft,almost velvety texture. 1. Combine shrimps with MAGGI MAGIC SARAP in a food processor. Process ingredients until finely chopped. 2. Scoop out a small hole at center of each tofu slice but not all the way through. Fill with about 2 tspns. shrimp mousse. Transfer onto a dish that will fit the steamer and steam for 10-15 minutes. 3. Drain excess water from the dish and pour sauce over steamed tofu. 4. Sprinkle with chopped onions before serving. 5. To make sauce, combine all ingredients in small bowl until sugar dissolves.